Bhairon Temple is located at a distance of 1.42 km from the Bhawan. The temple is situated at the highest point of the adjacent hill at an altitude of 6,619 ft. This temple also involves a steep climb which can be undertaken by foot, ponies or palanquins. It is believed that the journey to Mata Vaishno Devi is not complete without the darshan in Bhairon Temple. 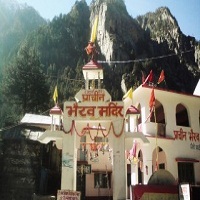 According to the legends, Bhairon Nath was killed by Vaishno Devi and while seeking an apology, was given a boon of being the last link of the pilgrimage. Darshan inside Bhairon Temple is also in the rock form. It is believed that when Mata killed Bhairon Nath, his head fell at this place while his body remained at the entrance of the holy cave. There is also a Havan Kund at the temple, whose ashes are considered to be sacred.